Mac OS X Lion Mail.app has a ton of new features and not the least of them is the conversation view that makes it look much in like Gmail. Still, unlike Gmail, Mail.app by default shows only incoming conversation and omits sent messages, unless one presses the “Show related messages” button. Fortunately there is a preference option to turn this on constantly. 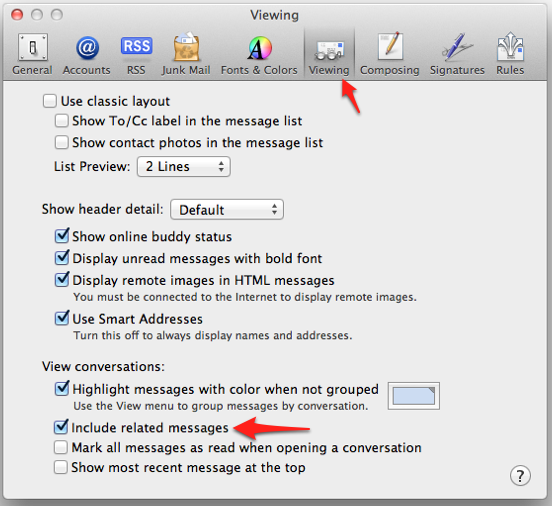 Go to menu “Mail > Preferences > View” and check “Include related messages” box. I wonder why this option is turned off by default?